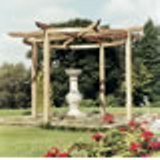 This triangle shelter sail is ideal for a larger sized garden. 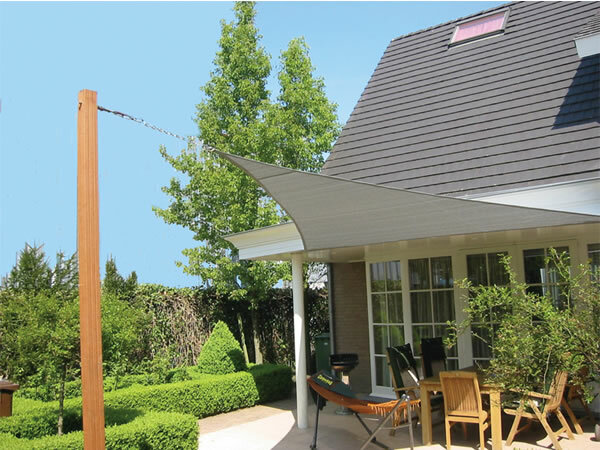 This lightweight sail provides high UV protection in an elegant attractive design. The advantage with a triangle sail its versatility when positioning. These are a very strong design made from 320 gr/m.sq polyethylene. The sail comes with a three year manufacturer guarantee. This triangle sail will provide a fantastic focal point to any outdoor space which can be used for simply relaxing or for entertaining. These sails are a simple yet versatile structure that can be positioned almost anywhere. For example, the sail can be positioned with different heights at each corner for a striking design, or against a house above a patio area. The optional fitting kit includes all fittings needed for the three corners as well as a spanner. 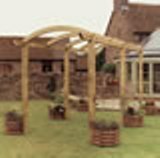 The fixings can be used almost anywhere for example, trees, walls or timber posts. This product does not include the timber posts. The timber posts are for illustration purposes only.